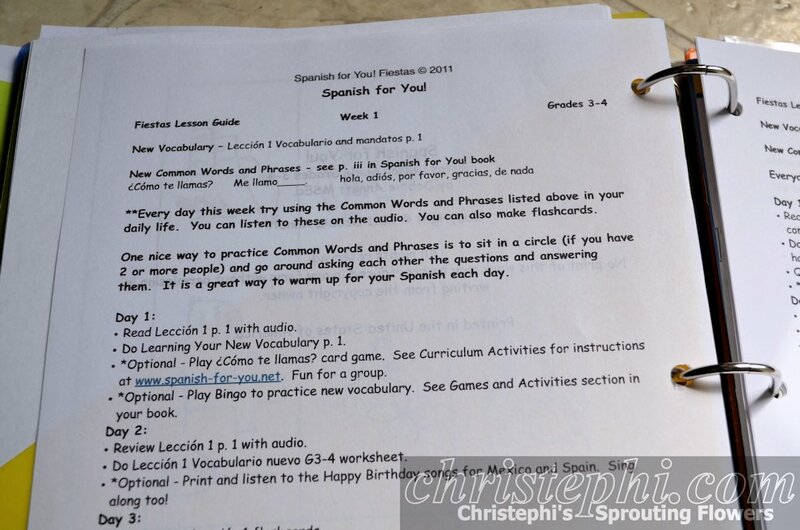 Christephi.com: Review: Spanish for You! I love languages! In college, I majored in Linguistics, which I found completely fascinating. I took courses in several languages including Spanish, Russian and Mandarin Chinese. Sadly, I've never become fluent -- or even conversational -- in any language other than my native English. There are so many advantages to being ability to speak a foreign language both personally and professionally. I want that for my children. But it can be intimidating! How do I teach what I myself haven't mastered? The right curriculum can remove much of that intimidation. When I first opened the Spanish for You! book, I was impressed! 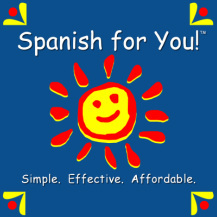 Here was an affordable year-long Spanish language program that can be used for a range of ages at the same time. 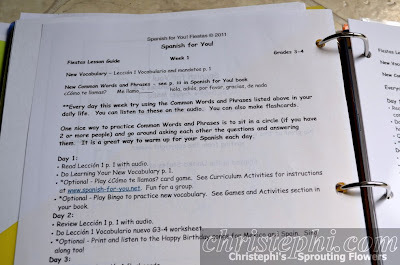 It presents material to students in a spiraling fashion so that regardless of a student's prior experience with Spanish they'll be able to add to their existing knowledge. This allows for groups of students with different levels of experience to learn right alongside one another, a huge plus for traditional classrooms with new students coming in or co-op classes with students of different ages. There are currently two themed books available from Spanish for You!, Fiestas (celebrations) and Estaciones (seasons). A single grade level costs $39.95. Or you can purchase grades 3-8 together for $64.95. Another book Viajes (travels) will be available soon and is currently offered as a truncated trial version (4 weeks for $9.99 or 6 weeks for $12.99). The Lesson Guides for grades 5 to 8 are set up for a span of 24 weeks. The Lesson Guide for grade 3-4 is for a span of 30 weeks to accommodate a slower pace for younger learners. It is assumed you will be teaching four days a week for 10-30 minutes each day. However, the instructions explicitly state that you can modify this schedule to suit your needs. You can go at your own pace as long as you do the work in order. Spanish for You! Lesson Guide for Grades 3-4. In Fiestas there are five Lecciónes or Lessons, each covering a holiday or celebration native to Spanish-speaking countries. These are really more like units than lessons as each one spans 5 or 6 weeks. I found this terminology a little mentally frustrating at first when we were still on Lección 1 after 3 weeks! But academically, the pace seems to be just right. New vocabulary is presented first, then relevant commands are introduced. The commands lead directly to the verbs from which they derive. The verb conjugations are then put together with the vocabulary to make meaningful sentences. Add in an aspect of grammar and finally put it all together! 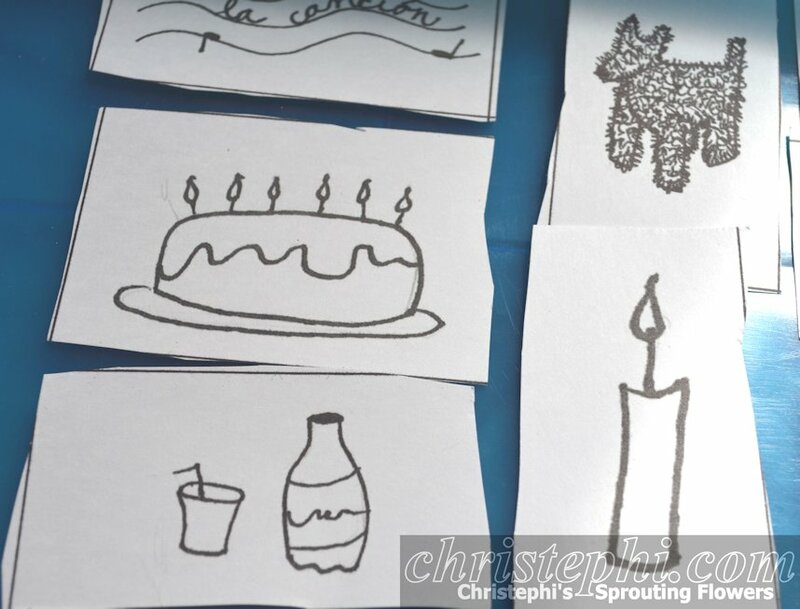 With such a nicely designed program, one thing that seemed odd to me was the almost-sloppy illustrations in the book and on the flashcards. So I asked author Debbie Annett about it. She told me that the illustrations were drawn by her daughter. She really wanted the curriculum to belong to the kids and, specifically, to be illustrated by a child. She believes that children don't learn any better from fancy, costly materials than they do from simple, well-presented material and engaging, purposeful activities. She said, "While glossy, colored graphics are nice (and I am certainly not saying they are a negative! ), that is an extra cost in the production of something. I wanted this curriculum to be one kids would enjoy and that would be inexpensive and effective." While the program might lack visual polish and flair, it certainly does not lack scholastic heft! This is where the curriculum really shines. 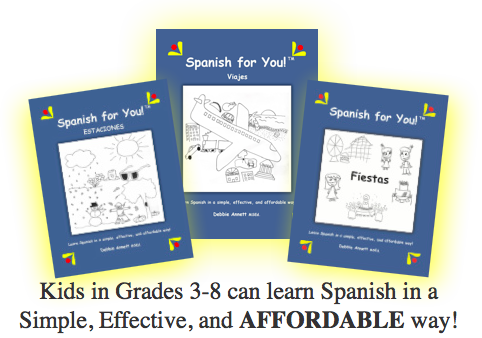 Each lesson is carefully constructed based on the author's 14 years of experience as a Spanish teacher. The lesson guide clearly lays out what to teach each day and covers everything from the alphabet, numbers, and colors to more complex grammatical concepts. There are numerous games and activities suggestions that make learning fun. Each Spanish for You! package has been put to the test in the author's own classroom before it is ever offered for sale. Another important component of any foreign language program is pronunciation. Each Spanish for You! package comes with not one, but two sets of audio. The first was recorded by a native English speaker and is spoken at a slower pace. Linguistically, this is important because as English speakers ourselves, we share the same set of phonemes or recognizable bits of sound that make up words. This makes understanding the correct pronunciation easy. A foreign voice sounds foreign to us partly because they use different phonetics than we're used to and our ears have a hard time separating the sounds through our native phonemic filter. 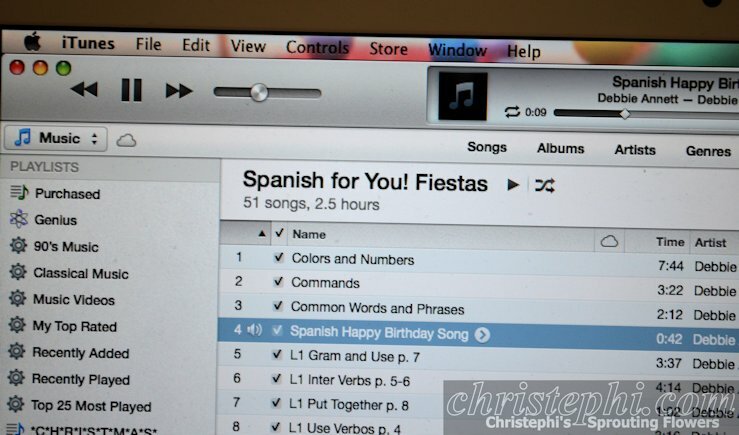 The second set of audio was recorded by a native Spanish speaker from Mexico and is spoken at a more natural pace. For a beginner, that natural pace sounds awfully fast! 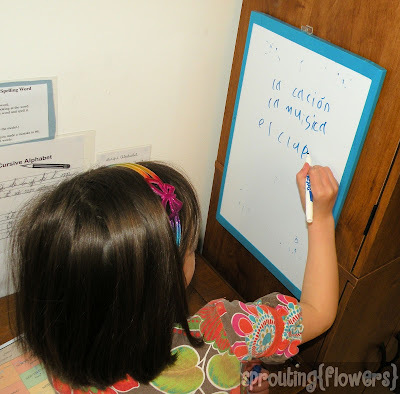 But it too is important so that a new set of phonemes can begin to form in the student's mind that will allow him to separate the sounds of Spanish into the meaningful bits that make up words. Bottom line: it helps develop fluency to have both native and non-native sound tracks for every page of the book! I love the concept of spiraling material! As the student works through one of the Spanish for You! books, the material within that book builds upon itself. What was learned at the beginning shows up again in later lessons. Then each successive lesson pulls from the material learned in the previous lessons. This means students continuously review as they go along and build on what they've already learned. Although the material spirals within a book, the materials between books does not spiral, so the books can be done in any order. 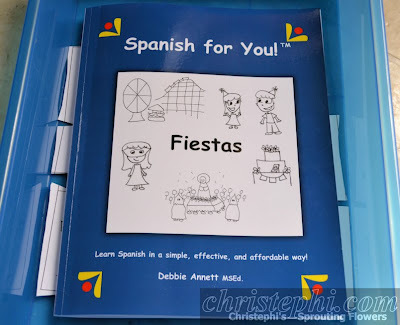 This allows students in a classroom setting come into a class and learn the material within their grade level whether or not they've had previous Spanish experience! I still have mixed feelings about the illustrations in Fiestas. 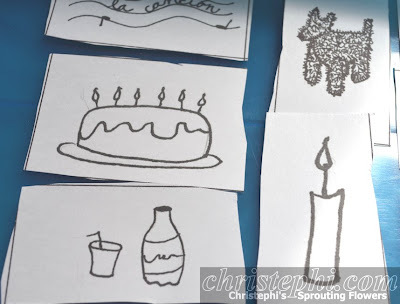 Part of me applauds Debbie Annett's reasoning behind her choice of artwork, but part of me would like to see cleaner, neater drawings to illustrate each word. However, Miss M doesn't seem to mind them in the slightest! I was very careful to keep my thoughts about them to myself and waited to see if she would say anything about them, but she hasn't. And believe me, if she had thought they were "off" she would have said something! She's not one to hold back her opinion! Ha! 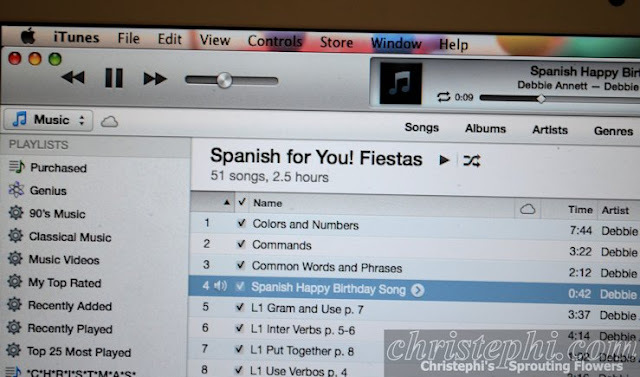 Although I think Fiestas did a wonderful job of introducing some important cultural holidays, I did feel it would have been beneficial to include words that our students can use when celebrating holidays right here in the U.S. Most of our students will not be traveling to foreign countries anytime soon, but they might encounter a Spanish-speaking child in their own neighborhood. It would be nice if they could say "Merry Christmas" or ask what their family will be eating for Thanksgiving. The book is printed entirely in Comic Sans. COMIC. SANS. Nooooooooo! Did you know there are entire websites dedicated to the eradication of Comic Sans? You can even download PSA flyers to hand out to offenders. Okay, this may not be the most compelling bit of criticism, but really, for the sake of all that is lovely, forego using Comic Sans in the future, m'kay? Trust me, posterity will thank you! Talk about affordable! I really don't think you'll find a more effective, comprehensive program at a better price anywhere! What you're giving up in bling, you're more than making up for in academic excellence! I haven't run across any other complete, full-year Spanish language program that you can get for only $40! And only $65 for all three grade levels (3-4, 5-6, and 7-8)! Practicing Spanish vocabulary on the whiteboard. 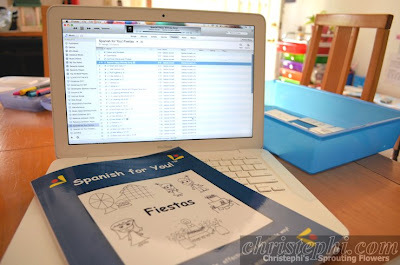 I've been scheduling our Spanish lessons near the end of our school day to allow for time to get our other work done. Unfortunately, by this time Miss M is usually losing focus and ready to quit for the day. Because of that, I think we'll be setting aside formal foreign language study for a while until she's able to concentrate a little longer. I hope to keep up some informal conversational study to at least keep fresh some basic phrases and vocabulary. ¡Hasta luego! Until next time, amigos! Fantastic review. Love your graphics. Thanks for sharing. Thank you! I suffered from insomnia one night and got up to make the graphics. LOL! 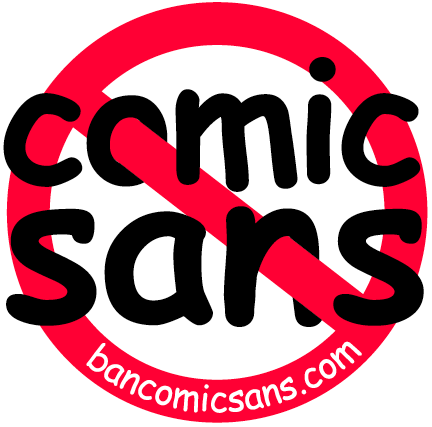 I'm one of the few that actually like the comic font, so no, don't ban it ;) Great review. Haha! Yes, there seem to be two camps….those that love it and those that hate it. :-) Celebrate diversity!